Sclerotherapy is a procedure that eliminates spider veins and varicose veins by means of a saline injection directly into the veins. 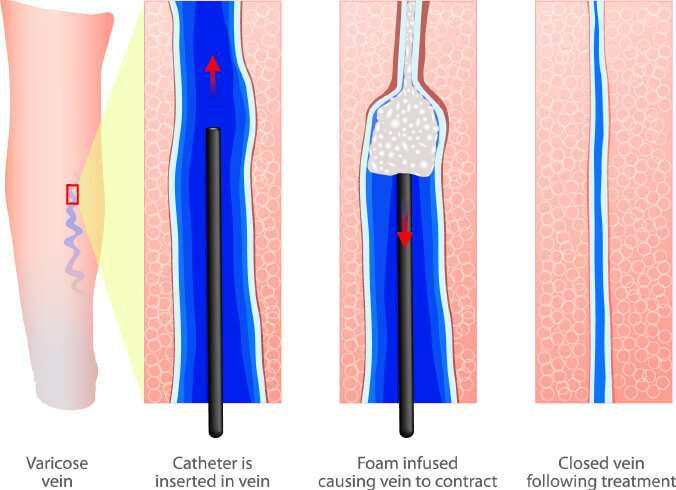 The solution blocks the blood flow to the affected vein, causing it to clot. Once clotted, your blood will be directed into other, healthier veins. The damaged vein will eventually turn to scar tissue and be absorbed into your body. Those who are afflicted with spider veins and varicose veins are candidates for sclerotherapy. A physician will evaluate each patient’s medical history and current health status to determine if more than one vein will be treated during the session. The location of the varicose veins also is a determination if the injections should be performed during one session or if it should be broken up into several sessions. Pregnant women are not eligible for this procedure. More than one session may be required to eliminate a damaged vein. Anywhere from 50% to 80% of injected veins will respond to the injections in a positive manner. A very small portion of patients do not respond well to the saline solution. Other treatments are recommended for these individuals. Sclerotherapy is a simple procedure that can be performed in your doctor’s office. It normally only takes about 15 minutes to be complete. You might feel a pinching sensation for the first couple of minutes following the injection. This is normal. Some doctors recommend taking an anti-inflammatory prior to and after the procedure. Also, compression stockings or socks are commonly prescribed for the patient after having sclerotherapy. The compression helps support the veins and reduce swelling in the lower leg. You can go about your normal activities immediately after having the injection. But, extreme physical activity should be limited for a couple of days. In Florida we tend to wear shorts and dresses year round due to the warm weather. Our legs are more visible, so eliminating any unsightly spider or varicose veins is sought after. These blue, squiggly lines, sometimes bulging, can be embarrassing when out in public. We do not want you to feel shameful or the need to wear long pants in the hot, humid Florida climate. have spider veins or varicose veins.